The development of sophisticated calligraphy as an art form is not unique to Islamic culture. Other examples include Chinese and Japanese calligraphy and illuminated bibles from north-west Europe including the famous Book of Kells. In the Islamic world, however, calligraphy has been used to a much greater extent and in astonishingly varied and imaginative ways, which have taken the written word far beyond pen and paper into all art forms and materials. For these reasons, calligraphy may be counted as a uniquely original feature of Islamic art. The genius of Islamic calligraphy lies not only in the endless creativity and versatility, but also in the balance struck by calligraphers between transmitting a text and expressing its meaning through a formal aesthetic code. Here’s a great passive program for any cultural festival, coffee house or open mic event. Invite our artist to set-up a mini exhibit of Arabic calligraphy artwork that will engage students to experience something new. 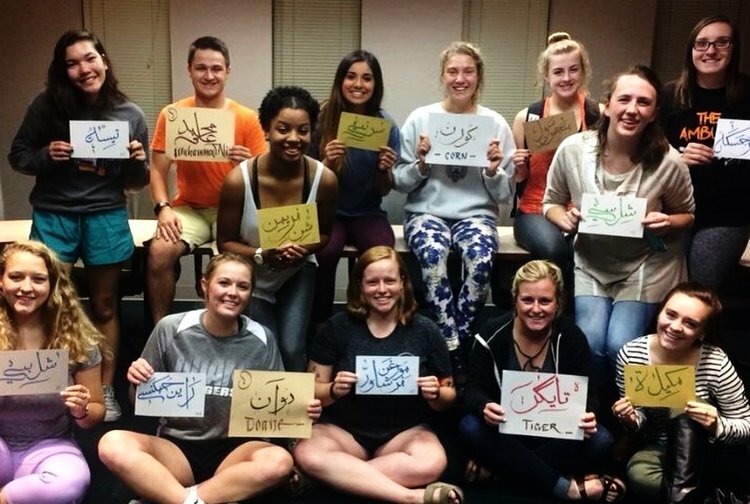 For a full three hours, students stop by on their own time to get their names written in Arabic calligraphy. It’s a memorable time for students, faculty, and staff as they take home beautiful calligraphy keepsakes. 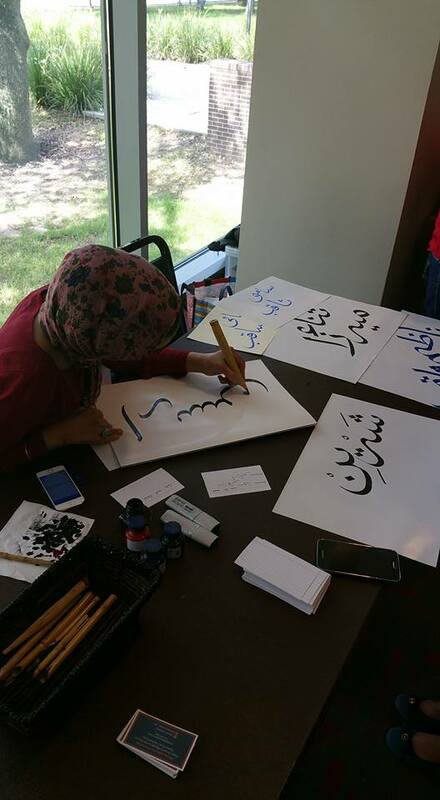 Want to do a hands-on program where students learn more about the Arabic language and different styles of Arabic calligraphy? Book our workshop! Art supplies are provided for up to fifty participants. A great add-on to the Get Your Name Written in Arabic Calligraphy program.